If you have an older version of Adobe Acrobat Reader, we recommend installing the upgrade version. 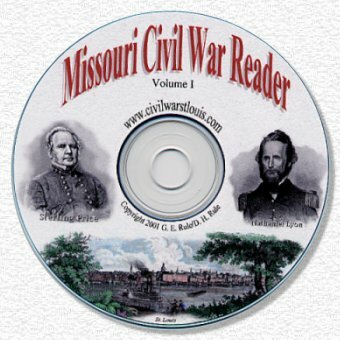 While the Missouri Civil War Reader will work with older versions, the images will look better with the current version. Thomas L. Snead was, successively, a pro-Breckinridge newspaperman, aide to Governor Claiborne Jackson, adjutant to General Sterling Price, and CSA Congressman from Missouri. His "The Fight for Missouri: From the Election of Lincoln to the Death of Lyon" is the best first hand account of events in Missouri from late 1860 through the Battle of Wilson’s Creek in August of 1861. Predictably, many Pro-Union partisans regard Snead as hopelessly biased towards the secessionist’s point of view. More surprisingly, some Pro-Confederate partisans consider that by 1886 Snead was too much of a "reconstructed Rebel" and not strident enough in defending the secessionist point of view. Snead himself was not above playing hardball during the war, signing the order in 1863 on behalf of General Sterling Price directing Captain Thomas E. Courtenay to raise a corps of 20 men for secret service to engage in sabotage behind Union lines in the Trans-Mississippi. Given Snead’s background, it is perhaps not surprising that he focuses a great deal of his attention on the political maneuvering between Missouri’s Unconditional Union Men, Conditional Union Men, and Secessionists in the months between the election of Lincoln in November of 1860 and his inauguration on March 4th, 1861. His analysis of how the greater part of the Conditional Union Men were slowly pulled to the Unconditional Union side of the ledger (Sterling Price being the most notable exception) makes for interesting reading. His account of St. Louis’ secessionists, the Minute Men, is particularly good. Given the central position in Confederate Missouri affairs which Snead enjoyed during the entire war --first as aide to Governor Jackson and then as adjutant to General Price-- it is a pity that he chose to end his narrative in August of 1861. Perhaps he wanted to do so at a high-point for those affairs (The Battle of Wilson’s Creek), so as to avoid having to relate and analyze the many bitter setbacks the Missouri Confederates were to experience in the years to come. A full accounting would also have required describing the connections between the official Missouri Confederate organization and the irregulars like Quantrill, Anderson, and OAK. Given the sensitive nature of this area, much of it was either never committed to paper in the first place, or was destroyed shortly thereafter. After the death of General Price in 1867, Snead would have been the best informed source on this topic. 342 Pages. Includes 22 illustrations, maps and plates (two in color). In 1863, at the age of sixteen, John McElroy joined an Illinois cavalry regiment. Six months later he was taken prisoner and remained so until the end of the war, spending much of the time at the infamous Andersonville prison. In 1879 he published a book about his experiences, “Andersonville: A Story of Rebel Military Prisons. Fifteen Months a Guest of the so-called Southern Confederacy”. In 1909 he was back with “Struggle for Missouri”, with little of his anti-Confederate heat dissipated. This book starts with a Missouri-centric history of the slavery controversy from the founding of the Republic and continues through the Battle of Pea Ridge in March of 1862. More on The Struggle for Missouri. . .
“The Struggle for Missouri” is dedicated “To the Union Men of Missouri,” and they get the better end of every argument or controversy in its pages. According to McElroy, the viciousness of the guerrilla war in Missouri was due to one simple fact --the mass of non-slaveholding secessionists were “White Trash” with a “dog-like fidelity” to the slaveholding upper-class secessionists. Just in case the reader might miss this vital point the first time, McElroy drives it home again and again, using “White Trash” nine times in his first chapter before settling down to just the occasional mention thereafter. This class was so relatively numerous in Missouri, according to McElroy, because most of the nice folk who were pioneering in the first half of the 1800s shunned slaveholding Missouri for more civilized places like Iowa, Nebraska, and Kansas. Despite McElroy’s “White Trash” obsession, “The Struggle for Missouri” does have virtues. The plates in it are very nice, with large, striking black & white plates of Union heroes like Blair, Fremont, Sigel, Curtis, and Schofield. There are nice plates of Claiborne Fox Jackson and Sterling Price as well. There are also two beautiful color plates --one of the fateful meeting in June of 1861 at the Planter’s House, and another of the St. Louis levy packed with steamboats before the war. McElroy supports his points liberally with more (and more complete) official documents than many other contemporary works on Missouri, though he usually fails to cite exactly where he found them. His description of the Planter’s Hotel confrontation between Lyon and Price has some poetry to it, and McElroy seems to respect Sterling Price as much as it is in him to respect any Confederate. The section on the reign of John Charles Fremont as Union commander of Missouri will bring great pleasure to connoisseurs of the snide comment and the snarky observation. 369 Pages. Includes 12 illustrations and views. Galusha Anderson was a pro-Union Baptist minister in St. Louis from 1858-1866. Unlike Snead & McElroy, Anderson’s book covers the entire course of the war in Missouri, focusing heavily on St. Louis itself. Among the many topics covered are the Minute Men and the Home Guard, the churches of St. Louis, Martial Law and property confiscation, refugees, the Sanitary Commission, the OAK scare of 1864, and the Loyalty Oath of 1865. More on The Story of a Border City During the Civil War. . .
Anderson’s opinion of his own importance in events is exaggerated, and at times the reader would be forgiven for thinking that Blair, Lyon, Fremont, Schofield, Rosecrans, et al could have just stayed in bed --it was really Galusha who held the fate of the Union cause in Missouri in his strong hands. At one point he has an agitated southerner blame his preaching for the Union seizure of Camp Jackson. One suspects Anderson would not want to discourage his readers from reaching the same conclusion. Describing his first blast from a St. Louis pulpit against the heresy of secession, Galusha reports the event with a freighted solemnity and attention to minute detail most historians would reserve for the third day at Gettysburg or the final scene at Appomattox. On the plus side, Anderson does have a fine eye for detail and his book is filled with many interesting anecdotes of life in St. Louis during the Civil War. Galusha’s Union sources (men like James O. Broadhead were his parishioners) seem to be excellent and allow the reader a valuable insight into the thinking of the pro-Union population of St. Louis. For those interested in the topic, Rev. Anderson’s book has many revealing stories of the stresses –and sometimes fractures-- that can occur in "Christian fellowship" during a time of political upheaval. 522 Pages. 8 full-page illustrations by Howard Chandler Christy. St. Louis native Winston Churchill was born in 1871, three years before that other fellow with the same name that the Brits are so proud of. The Crisis, based on his own family’s experiences in St. Louis during the war, is considered by some to be one of the greatest American novels ever written. Readers of Galusha Anderson’s “Border City” will recognize many of the incidents and situations that take place in this book, but as a novel The Crisis is free to focus more on the stresses and fractures of human relations during a very difficult time in the history of St. Louis. More on The Crisis. . . The novel focuses on the relationship between a young man of Northern heritage, Stephen Brice, and a fiery young lady of Southern proclivities, Virginia Carvel. In between, is all of St. Louis and a Civil War. Abraham Lincoln, U.S. Grant, and W.T. Sherman make significant appearances; Frank Blair and Nathanial Lyon less so, and Claiborne Jackson and Sterling Price are just off-stage characters. While the author is definitely of the opinion that, all things considered, the result of the war worked out for the best, pro-Southern figures are treated with respect. Virginia Carvel’s father, Colonel Comyn Carvel, is probably the most sympathetic character in the entire book, and the unmistakable villain is a young Northern man by the name of Eliphalet Hopper. St. Louis’ pro-Union German population makes a significant, and sympathetic, appearance as well. Later part of Morgan's Cavalry in Kentucky, at the beginning of the war Basil Duke was a young lawyer in St. Louis. He was one of the founders of the Minute Men, a secessionist organization. In his later years Duke published numerous reminiscences of the war. This presentation is his history of the early days of the war in St. Louis, Missouri excerpted from "The Reminiscences of Basil Duke.". 132 Pages. Many facsimiles of letters and newspaper articles. This exceedingly rare book—only 150 copies were printed—documents the three “controversies” between 1854 and 1856 that resulted in an “affair” under the code duello between Thomas C. Reynolds, U.S. Attorney, and B. Gratz Brown, editor of the Missouri Democrat. This duel was the last fought under the code in St. Louis that resulted in bloodshed (one more was fought a few years later, but no one was injured). Aside from the fascination of discovering the details and culture of the lost art of dueling, this book is significant to the Civil War (and hence its appearance on this CD), due to the identities of the duelists and their seconds. More on The Brown-Reynolds Duel. . .
Thomas C. Reynolds was to become Lieutenant-Governor of Missouri under Claiborne F. Jackson, and succeeded (at least according to the Confederate States of America), to the Governorship of Missouri upon the death of Jackson in 1862. B. Gratz Brown, Unconditional Unionist and Frank Blair’s cousin, was to later become Senator, Governor of Missouri, and vice-presidential candidate under Horace Greeley in the presidential election of 1872 (which they lost to U.S. Grant, who won a second term of office). D.M. Frost, who was later to become the unhappy commander of Camp Jackson, and then a Confederate General, makes an appearance as a second. . .for Brown! Isaac Sturgeon, author of “Sturgeon’s Folly” –which brought U.S. troops to St. Louis in January of 1861 to protect against an imaginary secessionist threat to the U.S. Treasury there, also appears by letter giving his account of his advice. . .to Reynolds! The experiences of former Senator Thomas Hart Benton, a famed expert and participant (either as principle or second) in many “affairs” also are covered at some length. No reproduction or distribution without permission of the respective authors. Feel free to link to this site, or to any individual page. Please don't hyperlink to pictures--query for permission to copy them to G. E. Rule.